Shopping cart so you can easily adopt-a-turkey or make a donation to Safe Haven (every little bit helps!) using PayPal or a credit card. A new educational area on living with compassion towards farm animals. 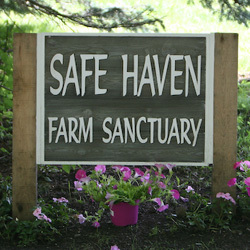 If you have any issues with the web site, you can contact webmaster@safehavenfarmsanctuary.org. Please use the comments on this blog to let us know what you think of the new site and any ideas you have for making the site more useful to you.